If you're looking for a sinfully simple Thanksgiving dessert (or just want to change things up without sending your family into fits), this recipe is the perfect choice. Similar enough to pecan pie that steadfast fans won't feel left out, but different enough that it won't leave you feeling like the same old thing! Simple, elegant (gluten free!) and addictively delicious -- what more could you ask for? 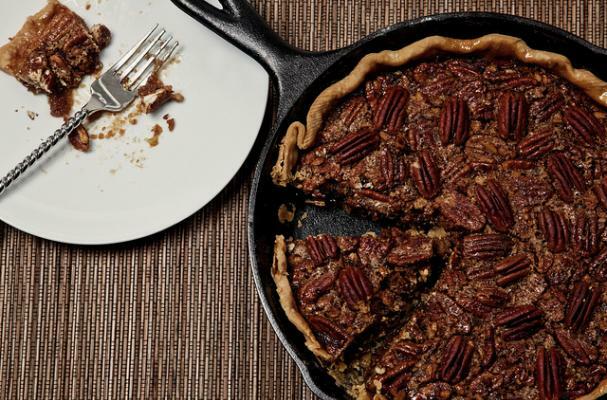 Prepare your pie crust and fit into a tart or quiche pan. Place the tart pan + crust on a baking sheet and refrigerate for 30 minutes before filling. In a medium (1 - 1 1/2 Qt) saucepan over medium heat, heat butter until golden brown and a nice, nutty aroma develops (first it will foam and bubble, then brown) - pay very close attention! It only takes seconds to go from browned to blackened! Transfer the butter to a small bowl and set aside to cool. In a large mixing bowl, combine the corn syrup, sugars, eggs, lemon juice, and salt and mix using a hand-held mixer or Kitchenaid. Beat until smooth, then stir in the pecans. Pour the mixture into the prepared tart pan and bake for 10 minutes. Reduce your oven temperature to 325º F and continue baking the tart for an additional 40-50 minutes, or until a knife inserted into the center comes out clean (the tart should still jiggle slightly when shaken). Transfer the tart to a wire rack to cool for at least 1 hour before allowing the tart to cool and set completely in the refrigerator (2-3 hours). Allow the tart to come to room temperature before serving -- for best results, prepare a day in advance.